Now that the deadline for submission has passed, I think it is safe to publish portions of my application to the California Capitol Fellows Programs. There are four different fellowships, each accepting 18 applicants every year. I applied for the state assembly, the senate and the executive programs, leaving the judicial fellowship for those whose aspirations are of a more legal nature. The following is my "Personal Statement" prepared exclusively for the senate program. Ever since my very first job as a paperboy for the now defunct Palo Alto Times, I have been captivated by news and politics. It wasn’t my intention, but as I was folding papers for delivery in my neighborhood, I often found myself reading the news. On occasion, my papers would be delivered a little bit late because I would get caught up in the news of the day. Although my passion for news and politics has been more or less apparent over the ensuing 30 plus years, the fire has always remained lit. Now 45, it burns brighter than ever. The media, it seems, has a penchant for reporting “bad” news. When it comes to politics, scandal and corruption are always prominently splashed above the fold across page one. Of course the bean counters will tell us that bad news sells and that is what the public wants… and the watchdog role of the press is indeed a sacred one. And although all of that is true to an extent, isn’t it also the responsibility of the press to report on the real work that goes on in our government? Until I entered the field of journalism and saw for myself, I, too, was caught up in the perception that our government was full of self-seeking, power-hungry and, at worst, corrupt politicians who didn’t care at all about the people who put them in power. After many years trying to live a life in pursuit of happiness, I found that perhaps my perception was misguided. Not that I had some miraculous change of heart about our elected and appointed officials, but rather about myself. I found that in my pursuit of happiness, I was missing something and it wasn’t until my life literally came to a grinding halt on October 17, 2000 that I was able take the time to figure out what it was. I was involved in a violent head-on collision with a logging truck near Squaw Valley, Calif. I woke up in a Reno hospital sometime in November. I was lucky to be alive, but I had massive injuries that would not heal overnight. I remember the 2000 presidential election was still being contested and my disgust with myself, with politics and the great unfairness of the world in general was palpable. After a long hospitalization and an even longer rehabilitation, my perspective started to change. In my pursuit of the “good life,” I was only thinking of my own comfort and myself. Although I never set out to do any harm, I wasn’t particularly trying to do any good either. I started to see public life and public service in a different light. Finally, in late 2003, I decide to go back to school to pursue a career that would mean more than just a job. It was many years since my last attempt at higher education; the application process included some assessment tests to gauge my knowledge. Even though I have always known that I could write well, I was still shocked when I qualified to take an honors section for freshman composition. The rest, as they say, is history. 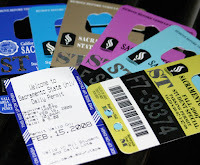 I transferred from American River College to Sacramento State in the fall of 2005 and changed my major from journalism to government-journalism, a major unique to Sacramento State that takes the disciplines of political science and journalism and combines them into one rigorous major. Although my cynicism for government had tempered significantly, it was not until I actually had personal and regular contact with public officials on different levels that I began to see a different side of public service - and public servants. By mid-2006 I was writing professionally for a small paper in Colfax, Calif., covering, among other things, the Colfax City Council. Although I was not particularly surprised to see residents of a small town volunteer their time to be unappreciated in the name of public service, my education did not end in Colfax. I was also fortunate to be writing news during the 2006 mid-term election and covered much more prominent - and coveted - offices. My path also put me in touch with staff members of state and national officials and I found that the ideal of public service extends well beyond the elected official. Finally, on a class trip to the State Capitol, Assemblyman Mark Leno’s then Legislative Director, Kathryn Dresslar confirmed what I was already beginning to believe: The vast majority of our elected and appointed officials are there primarily to serve their community. It is a statement that embodies a perception I have carried ever since. Although I was already on the hunt for “good” news by this time, I redoubled my efforts to not only find it, but to get it into the paper. Good journalism isn’t limited to digging up dirt and finding controversy, it should help to build communities. It is the glue that holds the fabric of the community together. If our public officials can be faulted, it is in their inability to convey what really goes on in government to their constituents. Communication is an art, if not managed and practiced, it can be misconstrued or silenced altogether. There are complex, important issues in local and state government and it takes someone who not only understands the issues, but can also break them down so that everyone can understand them. I have done that in Colfax, I have done it in Rocklin and if given the chance, I am quite sure I can do it as a Fellow in the California Senate. The New York Times today ran a story today pointing out some of John McCain’s inconsistencies between his rhetoric and his actions. These comparisons are, of course, fair game and should be carefully scrutinized. The article goes into great detail (and after topping out at about 3,000 words, one might say too much detail) about past ethical liberties taken by McCain. Although the timing of this article should not raise many eyebrows, the initial attack on McCain in the story's lead certainly has. It puts me in the unenviable position of defending McCain and, to a much lesser extent, criticizing the New York Times. Indeed, the Times should be getting used to questions about its judgment. The article is ostensibly about where McCain’s loyalties lie: With the lobbyists or his constituents. It is a question that should be asked of any public servant. However, the Times didn’t lead with the possible inconsistencies of McCain; they lead with innuendo. Sexual innuendo… unproven and categorically denied rumors of infidelity from the 2000 presidential campaign, to be precise. Of course the story cited “unnamed” or “anonymous” sources, a metaphorical fire that has burnt the Times before. But even if the sources were reporting the truth, the truth they are reporting is only allegations… even the sources don’t know if an inappropriate relationship existed. Yet the Times, in their infinite wisdom, lead with this old and largely discounted rumor. In the Times defense, the alleged alleged affair was used to segue into a more pressing issue - McCain’s judgment regarding appearances and assumptions. It proceeded to look at some instances that would portray McCain as a “business as usual” politician - and at a time when he would like to be viewed as a reformer. His experience, like Hillary Clinton’s, shows that the lure of the lobbyist’s money has more pull than any desire - genuine or not - to truly change the rules. McCain-Feingold did change the campaign cash game… but only after McCain had availed himself of it for many years. But all of that has little to do with the deliberate and direct attempt by the Times to sully McCain’s reputation. The strange thing is that the Times didn’t need to drag up dead issues from the past. Let’s get real here - all 3,000 or so words of the Times epic was old news. All of it. Why not take a closer look at McCain’s current position on - oh, I don’t know… maybe the war. Although it is true the war has faded in prominence behind the economy, it is still moving along as if on autopilot (a thinly veiled commentary on the intelligence behind the entire affair), it is also true that McCain is the only viable candidate that would not only “stay the course,” but also quite probably accelerate it. A presence in Iraq for 100 years? He said that - and recently, too. As I sit here composing my thoughts, I can hear the lead story coming from Brian Williams on the NBC Nightly News on the TV in the next room. Guess what it’s about? That’s right, but the story has morphed. Although McCain has not escaped the innuendo, the story is now joined at the hip with the one regarding the Times’ agenda. If the goal was to shed light on McCain’s questionable judgment, then they have succeeded in that endeavor. But at what cost? Can the Times really afford another hit to its already failing reputation? Perhaps the nation’s de facto agenda setter is losing its grip on the real world. Maybe its judgment has become just as clouded as those they are questioning. Motivation often springs from the simplest of things. It has been almost two months since I last set foot on the campus of my Alma mater. Two months since the academic life was my life. Two months since I have felt like I have accomplished much of anything. Although that is not true and I know it, the fact still remains that I have not been challenged much of late. Not in terms of intellectual pursuits, or, perhaps more to the point, in terms of commitment of my time. I have had far too much and as much as I hate to face it, the fact is much of it has been wasted. As if that weren’t enough, that old familiar driving force, that looming and growing nemesis, friend and foe simultaneously - an impending and accelerated deadline is staring me square in the face. Due to factors beyond my control, the deadline for post-graduate applications at Sac State have been moved up by one month. I have been squandering time as though I had until April 1st to have my ducks in order. Now March 1st is my deadline and there is a lot of work to do. No simple application process here, there are forms to fill out, transcripts to acquire, letters of recommendation to solicit and a test to take. Although I initiated the process some time ago, it has been sitting in limbo largely unfinished for several weeks. Maybe it’s the air on campus - the freshness that is emitted from the park-like setting in the middle of an urban concrete jungle. Perhaps the sight of my home turf for the past almost three years stirred something in me. Could it be the squirrels? I don’t know what, exactly, caught fire, but I miss that place. I miss academia. I am good at being a student - it is a craft I have honed for the past several years. It wasn’t always so comfortable in the classroom, but today it is were I identify best. Getting a MA is the right path for me - it is the next big thing. And that is ok, for it could lead me to a life lived permanently in the classroom - on the other side of the podium. I have been working on a piece of writing for a week now. I don’t usually draw any of my writing out like that; I tend to sit down and write what I have to, need to or want to and finish it. One sitting, start to finish and I’m done. Even if it’s a longer work like a research paper or a policy statement, I’ll usually get it all framed out in on sitting - or at least an entire section of it. I have to be in a zone, in a moment and on a roll. It works better for me that way. It can have a daunting effect, however, as I will put off those moments when sufficient motivation drives me because I don’t want to make the commitment. It is always an open-ended commitment; I never know where or how far it will take me. When I do take the plunge and get interrupted, as was the case on the piece I started a week ago, it doesn’t feel like the same piece when I come back to it. It might have lost relevance or it could be that my head of steam, my outrage or whatever was pushing me simply went away. It’s not that I can’t finish it (I have added to it a couple of times now), it’s just that it has changed. It’s almost unfamiliar, a stranger, like we need to get reacquainted. We need to get to know one another all over again and it is sometimes somewhat uncomfortable. It’s not impossible and often it is unavoidable, but when I can avoid setting the work aside, I do. Will I return to it? Probably, but it won’t be what it would have been. The topic? It’s a reflective piece examining the tumult of the late sixties and early seventies through the eyes of the child I was during that time. Not particularly original, I know, but the twist is in the growing understanding of what that time meant as I have gained understanding and maturity; taking that insight and applying it to the state of national and world affairs today. In short, it got complicated… my thoughts and the path I was initially motivated toward has changed and I don’t see a clear path through the piece anymore. I know it sounds as though I have a very clear idea of what I wanted to do and to a certain extent there is a great deal of truth in that, however, in the moment of conception, there was something else; the idea almost had a life of its own. I only had to nurture it. The intangible element is now gone and I can no more recreate it than I could produce it in the first place. This stuff is just comes to me; I have no control when, how or where. Often it is an attempt to understand, sometimes it is an attempt to vent frustration and this time it is something of a hybrid of seeking understanding and venting frustration. I wanted to find that grove again - it was a good one. Instead, I have written my way into this one. So here it is, one sitting and so many words magically appearing before me. In a way, this is a substitution - a late forth quarter rally to get some points on the board. It’s a way to salvage what didn’t make it to publication - yet, but hopefully will reincarnate as something worthy of disbursement soon. I am frustrated on a number of levels and I am seeking a means to make some sense of it all - writing almost always works. The piece sitting in literary limbo is eating at me - and perhaps that is its purpose. From it this has spawned and maybe this will return the favor. I had an editor explain to me that writers tend to get “married” to their words. I didn’t really buy that, but if it means a reluctance to discard what has already been composed, then I guess that’s true. I have very little unfinished writing, but there is some. Burried deep on my computer are drafts of pieces that I just never finished or for some other reason remain unread. I can’t seem to delete them. Maybe I’m married to them. Write… something. At this point, anything. Oh, I’m sorry. Pardon me. I’m just talking to myself again. Well, writing to myself to be precise. I am looking for clarity, for just a little bit of understanding. In my experience, the best vehicle for me is the written word. Although I cannot say right now whether this will be published or not, you, dear reader, already know; you’re reading it. Of course, when I say published it must be understood that there is a difference between publishing my work and selling it. I am quite clear that no one is going to buy this dribble - not while I’m alive anyway. Yes, I guess it would help if I got to it. For the past few weeks, my life has slowed considerably and rapidly. Indeed, it feels like it has come to a screeching halt and in some respects, it pretty much has. Those of you who have been following along know the success my recent past seen. After a stellar undergraduate experience capped by a BA in government-journalism from Sacramento State, the future looked very bright indeed. Don’t get me wrong, it still does, but I have had to reframe the time period in which that future will take place. It is not, nor has it proven to be immediately bright. That is not to say that my life is in some kind of tailspin, but it is in a holding pattern. Realistically, even in a thriving economy, the transition from the scholastic world to the professional takes more time than just getting a job. I knew this, and to be honest, having no pressure for a few minutes was looking pretty good, but enough is enough. I am deadline driven; if I don’t have anything that must be done, nothing will get done. It’s much more than a natural tendency towards procrastination - although I am afflicted with that as well. And no, my house is not falling apart at the seams; no, I have not turned into some kind of recluse. But my metabolism as it applies to being productive has slowed - noticeably. And that I am aware of this potential hibernation setting in is a good thing, because of it I know that something must be done. So I do what I do best: I write about it. I did not know where, exactly, this string of words and punctuation would lead me, but experience tells me that once I start the words just come. It taps into an area of my conscious that is otherwise inaccessible. Maybe because the process of writing slows my mind down (I “type” very slowly) or perhaps the added task of encoding my thoughts into words helps to organize them… I don’t know. I do know that once the floodgates are open, the words just flow. It gives me a different perspective and helps motivate me to do more - even if the rewards are not immediate. The clarity I gain from thinking all the way through an issue, even one that is abstract and has no concrete definition has a calming quality. The fact that I have now, at this moment, laid down 543 words is an accomplishment all by itself - productive all by itself. As elusive as the source and nature of my discomfort is, writing about it anyway brings relief even if I can’t figure out why. Could it be that I am working under a deadline of a different sort? Is it possible that my complacency limit has been reached and it is now - right now - that I am forced by some equally abstract deadline to do something about it? And perhaps that is all there is to it. Tomorrow, I have a couple of things that I need to do and several more that could be put off. The question tonight (currently 1:32 A.M.) is simple: Am I sufficiently motivated to get the stories done? At the moment I can say yes, my intention is to get back into life and work. The new deadline? I have had enough relaxation, I am quite done doing nothing. I know that the long-term career perspectives are still just that, but I also know that when the time comes to pounce, I will only have to redirect my efforts; I will not have to get motivated all over again. I’m writing that out right now.